Nathan Penn has become the 2018/2019 Cranecorp WA Modified Sedan Series Champion by virtue of claiming a runner up finish in the final round held last night at the Moora Speedway in the Central Midlands region of Western Australia. Penn defeated Matt Noakes by just two points in the series standings with Noakes claiming the feature race win at the final round. Twelve Modified Sedans converged on the Moora Speedway with former State Champion Allan Mortimer out after hot laps with engine related problems. 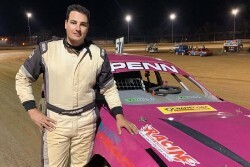 Nathan Penn dominated the opening heat race of the night with Dale Cockmans debut in the division ending early with the local Moora driver also experiencing engine issues. The Picton Automotive Ford Falcon of Adam Houston would lead the second heat race from start to finish with Penn and Noakes having a great battle for second in the concluding stages. Noakes wrestled some points back in the final heat leading the entire ten laps with Penn only finding a way past Branden Fraser on the final lap of the race for second place. The Southern Stump & Mulching Services Shootout went the way of Matt Noakes with the two series point leaders sharing the front row for the main event. Noakes stormed away from the field at the start of the feature race with Penn immediately under pressure from Branden Fraser in the battle for second. Further back Houston, Paul Stevens, Matt Kata and Anthony King had a great tussle for the minor placings with Noakes continuing to increase his lead in the final laps. Noakes would go on to record his fourth feature race win of the 2018/2019 Cranecorp WA Modified Sedan Series with Penn narrowly holding on to second place with Branden Fraser applying loads of pressure as the race concluded. Matt Kata got into fourth by the end of the twenty laps finishing ahead of Houston, Stevens, King and Merv Penn. Nathan Penn was extremely emotional post race where he thanked his family and crew for all their support in helping him take out his maiden WA Modified Sedan Series Championship. The Western Australian Modified Sedan Drivers Association would like to thank Moora Automotive Service & Repair for their support of the final round held at Moora Speedway. Modified Sedan racing in Western Australia will now take a short break ahead of the SSWA Modified Sedan State Title to be held at the Broome Speedway on Saturday 1st & Sunday 2nd June 2019.